It's not that the weekend is free from work, but it is more relaxing and laid back work which allows me time to work on my wee midget blocks in between. This one is number 24 and is called Hour Glass. 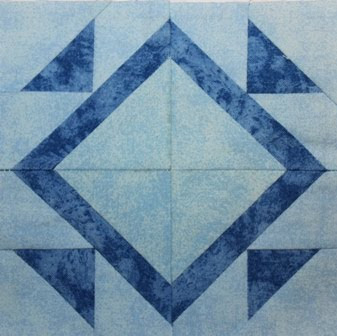 It is a simple scrap block made of half square triangles and squares. I got the yard mowed yesterday but never did any laundry. I'll do some of that today along with cleaning out my car. As usual, I should look at lesson plans for the week though I think I caught up on grading on Friday. Maybe, just maybe, I'll do a little more sewing. The next block is paper pieced and I'm still having sizing issues with the printer. I'll try to get that figured out once and for all. Midget block 23 is called Valentine. 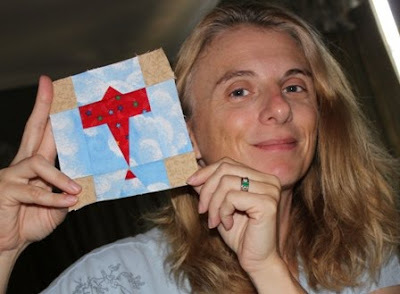 It was a simple, straight forward applique. 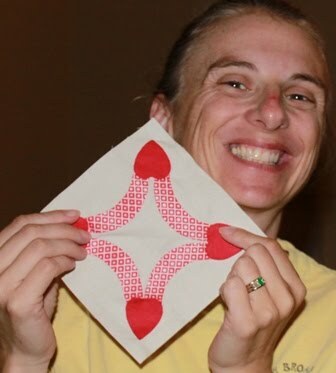 I sat next to the pool and sewed the edges while the boys swam. Ryan is having a friend sleepover and they wanted to go night swimming. I like patterns that are easy but look hard. This one looks simple enough, but it was impossible to put together. 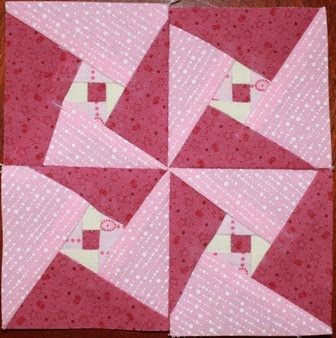 The pinwheel triangles should be easy enough to put together log cabin style, but there isn't a spot to start and stop. If you look really close at the white bits in the center, you can see that I cheated and cut off one of the corners to have a starting point. Think about how a traditional log cabin looks, the logs aren't all the same size. Even a courthouse steps arrangement leaves two sides shorter and two longer. Not knowing how else to approach it, I tried to do a partial seam. Have you ever attempted a partial seam on a paper pieced block with a finished size of 2.25 inches? I wouldn't recommend it! So, the angles are a little wonky, the lines are a little crooked, but until I can think of a better way to put it together, I'm calling this one done. I guess that is where the Dear Jane, "Better done than perfect" comes from. The longer I look at those outer triangles the more off they look. Guess I'd better go look at something else for a while. Kurt was out of town all week and I was sure I'd find time during the evenings after the kids were in bed to put together a block or two, but by the time I got them settled and tucked I was about ready to be done myself. He called on his way home to tell me that he was supposed to be on another trip this week, but I think he's managed to put it off. I'm glad he'll be here for a while, this single parent thing is no walk in the park. Company is gone and life is back to routine again, allowing me to sneak in a few minutes to work on my next block. I had an appointment with Anna's orthodontist after lunch and department meeting this afternoon, but other than that, it is all pretty calm and peaceful around here. Kurt is gone for a couple more days but evenings have been full of phone calls for Girl Scouts anyway. I'm getting closer to having all the new troops set up so I can put that job to rest for a while. Block 21 is called Snowball Flower. Isn't it just too cute for words? 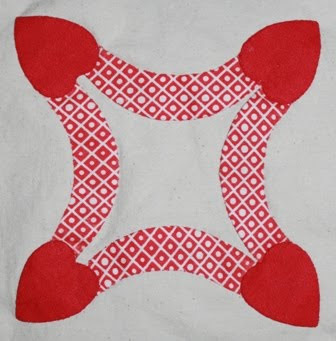 It is just two four patches with the top one rotated and appliqued on top of the other. So easy! This is one of those blocks that I could see making a whole bunch of. 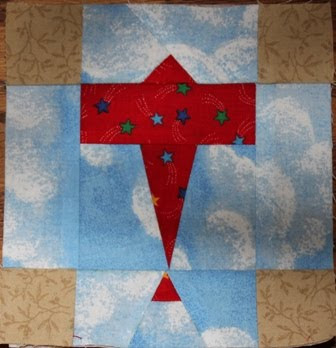 Wouldn't it be cute for a baby quilt? 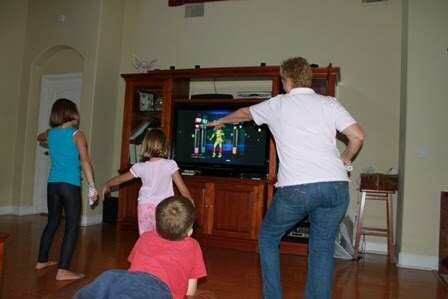 Mom is having a blast spending time with the kids. She took the girls out for manicures and lunch and then to the mall for shopping and girl time. We had fondue for dinner tonight and right now everyone is getting down with Just Dance on the Wii. I had some time between laundry loads this afternoon to play with my new fabric. I've only got the first 55 blocks printed, but I went through and started pulling fabrics to go with each of the blocks. Now I know what I am missing so that I can keep my eyes open next time I am out and about. 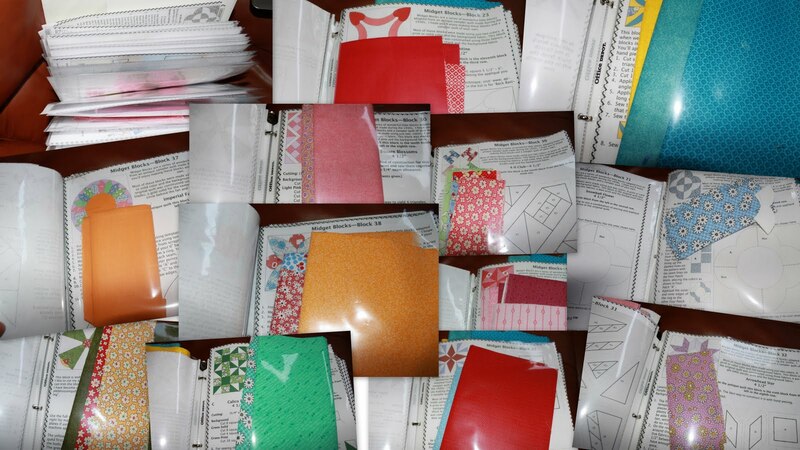 My poor little binder is stuffed to the gills, but it is holding the potential for lots of pretty quilt blocks. Maybe I can get some prep work done tomorrow night, but I'm not sure when I'll have time to get another little block done. It's been DAYS since I've sewn anything. I might go into withdraw if I don't find time soon. It wasn't that long ago that I ordered fabric online. I always make sure to pick out $50 worth at Connecting Threads to qualify for free shipping. They carry fat eighths which should be perfect for my diminutive blocks. I think I ordered two sets of solidish cuts and two of reproduction type prints along with some random sale fabric. I also got a jelly roll from Hancock's of Paducah along with a charm pack of Kona Solids. 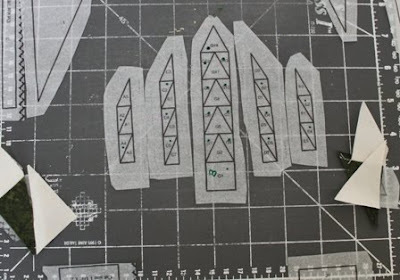 My mom is in town for the weekend, so there won't be any machine time to work on new blocks, but I did print out some more patterns and start matching up my new fabric bits with the patterns that I think I will use them for. Such fun! 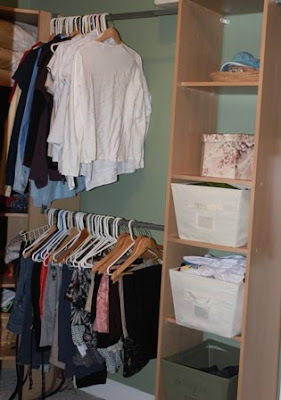 Knowing that I always forget to take "before" pictures, I went around the house a few weeks ago and got pictures of every explosion of messiness that existed in the house. Now I just have to systematically go through and tame each of them, one at a time. Today was the closet in the master bedroom. It doesn't always look this scary. I think this particular crisis followed our own summer vacation and a couple of business trips along with some company who needed extra linnens. Frightening isn't it? We had the carpet man coming today and it didn't seem fare to make him wade through all of that to get measurements. We decided that the organizers should come out so the carpet can go under, so I'll be trying to get rid of even more before the installation gets scheduled. Goodwill is coming for a pickup next week and they are going to find lots of fun stuff to take away. 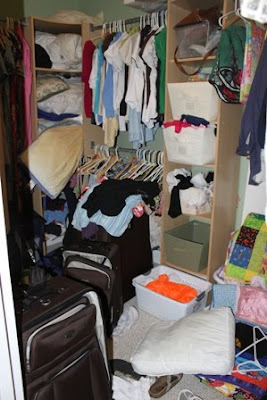 I have yet to tackle Kurt's side of the closet, but at least my half looks much better. 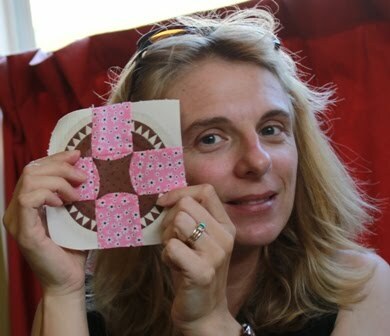 I didn't get a chance to make any midget blocks today. 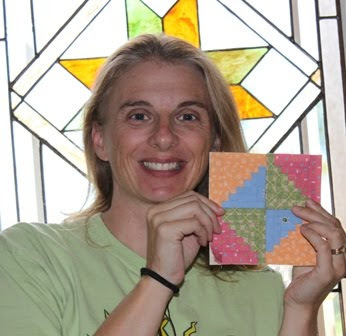 I measured the blocks I had already made and realized that all of the paper pieced patterns were coming out 3/8 of an inch too big. I'll have to mess around with my printer and see if I can get it just right before I get carried away again. My mom is coming to visit for the weekend so I really need to pick up all of the sewing stuff so that my studio can look like more of a guest bedroom. She doesn't mind at all, but it a good reason to clean everything up. Of all the things I could have chosen to become obsessed with, Midget Blocks aren't a bad choice. They are low in calories, highly adorable and will someday result in a finished quilt. This block had me a little puzzled. 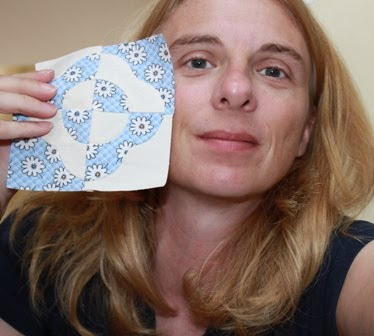 It combines paper piecing with curves. 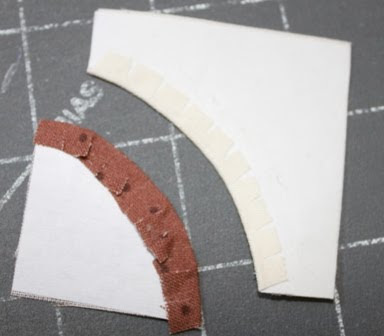 The little paper pieced arcs were pretty straight forward. Tiny yes, but not complicated. That left the curves. I've never been successful at pieced curves, so I cut out a freezer template and decided to applique. The original pattern showed light pink where I used the muslin background color, but I couldn't find two pinks that played well together, so I changed it up a bit. I also thought the little triangles would show up better with more contrast. 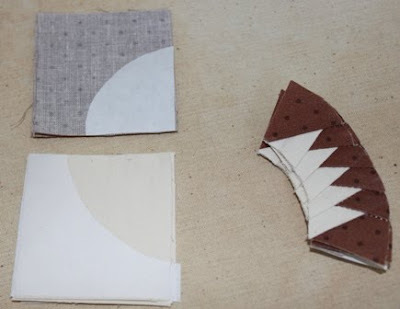 Trimming and gluing gave me perfect little curves that were ready to position on top of the paper pieced arcs.
' 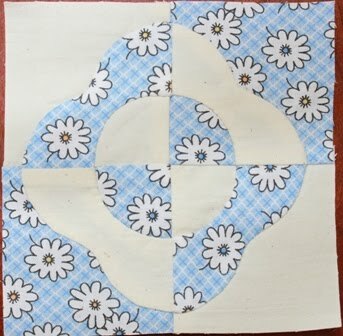 I was having trouble with the paper pieced patterns being too small with on my first couple of blocks. I changed my printer settings, and now they are coming out out too big. 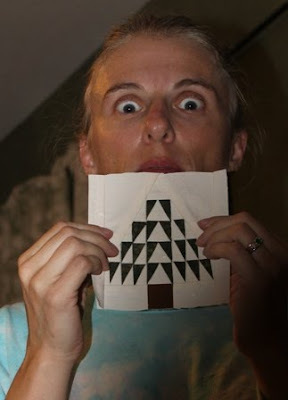 I trimmed everything up to 2 inches, even though it would mean imperfect triangles. The bus came in the middle of the blind hem stitching. Sydney wanted to know why I was sewing it when it was already finished. I'll admit that it looked better while it was all just glued down, but I've never been one of the steam a seam people, so applique happened. So, tada, here is block 20. Not nearly as difficult as I thought, but still makes me glad I am working in order or this pattern would have collected a lot of dust before I gave it a try. Tonight is the Girl Scout leader meeting. Fliers went home this week with my contact information, so I've been spending a lot of time on the phone setting up new troops. I'll be coaching Academic Team this year, and practices start this week. The kids activities will all start kicking in soon as well, so I'm sure life will be back to normal soon enough and my Midget Mania will come to an end. Until then though, how cute is that little block? Seriously. I haven't gotten tired of these little cuties yet. If I had discovered them at the beginning of summer vacation instead of the end I think I'd be done by now. It helps that at the beginning days of school there aren't a lot of papers to correct yet. Also, my beginning of the year lesson plans tend to be much more organized than my end of the year plans, allowing me to just pull out the plans and make minor tweaks. I worked on block number 18 this afternoon, and that went so quickly that I had time to throw together block 19 before the school bus got here. The kids have just finished homework and I'm sitting next to the pool supervising the swimming whilst updating my blog. I'm feeling pretty good about my life right now. So back to the blocks. 18 was easy enough, but for some reason the paper pieced segments came up just a little bigger than the rotary cut 2 inch blocks. I squared everything up by shaving off miniscule bits before putting them together. The contrast is low, but I guess they can't all stand out, right? Block 19 is adorable I think. 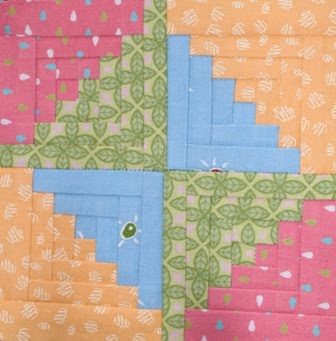 Except for the border it is just a churn dash block. Right? 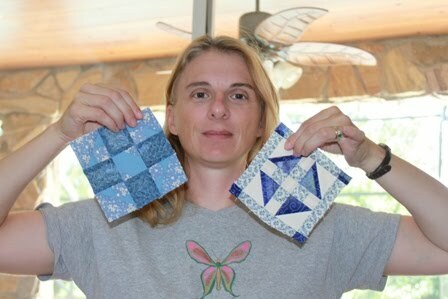 I cut the half square triangle pieces just a bit big so that I could square them up which I thought worked out well. 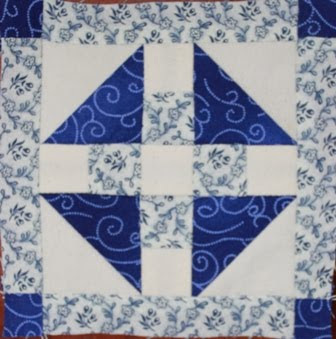 The border segments were supposed to be background colored, but I had just enough from a 6 inch charm square of fabric and decided to make them light blue instead. I think it looks good that way, don't you? 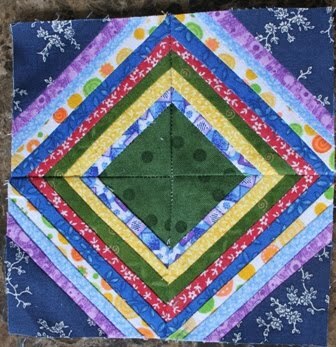 I always wonder on little blocks like this if the original quilt maker just didn't want to do the math to make it without a border or if she wanted to add the extra color to the edges. Either way, 18 and 19 are done. Block 20 looks a little scary. 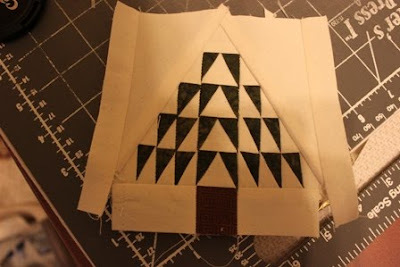 I've pulled the fabric, but I might have to work up my courage for all those itty bitty curved triangles. There is no other explanation for the explosive growth of my scrap basket. I'm sure it couldn't have been more than a couple of weeks ago that I was doing a happy dance because it was empty. Now look at it! Full to overflowing. Maybe if all is calm around here this evening I'll get out the GO and do some cutting. 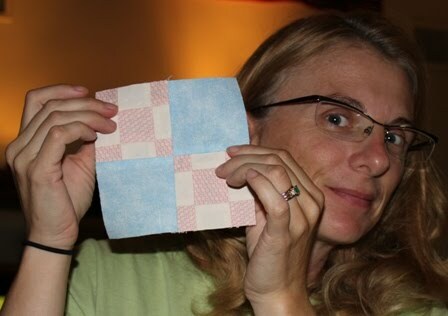 I've worked my way through all the 2.5 inch squares I had stacked up for L&Es. That would be a good use of some scraps. I've ordered some 1930 reproduction fabrics from Hancock's of Paducah and some from Connecting Threads. 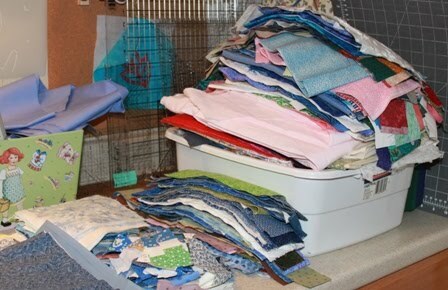 I'll feel really guilty if it comes in before I've dealt with this pile of fabric fun. My weekend has been full of little bits of this and little bits of that. Between loads of laundry this morning I got block 17 done. It is an Airplane, so I used some blue and white cloud fabric for the background. The tail is a little crooked, so I might fix that before the paper comes out. It was much simpler and more relaxing than the last block. I did fix the top of the tree this morning, so it looks a little pointier and without resorting to the green sharpie. Sydney was my photographer this morning and wanted Lizzie to be in the shot. Lizzie wanted to share kisses. We are headed off to an ice skating recital this afternoon and then I have Girl Scout things and school work I need to do. I'm sure I'll slow down on these little blocks soon enough, but I'm working through the initial momentum before I settle down to a more reasonable pace. Block 16 was so not fun. 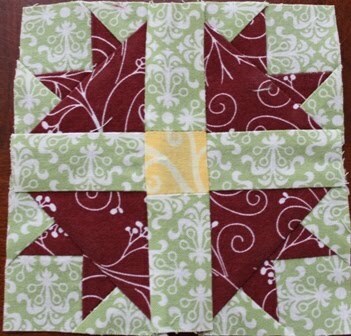 I started with the bottom corners by making some nice little over sized triangles. 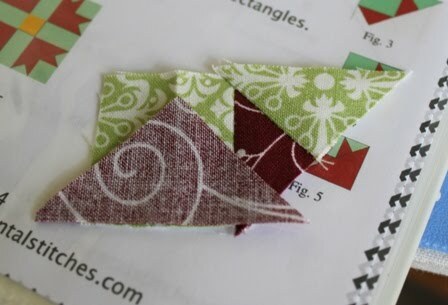 Between the mirror image symmetry and the strange angles, I managed to sew two green triangles backwards and had to start over. 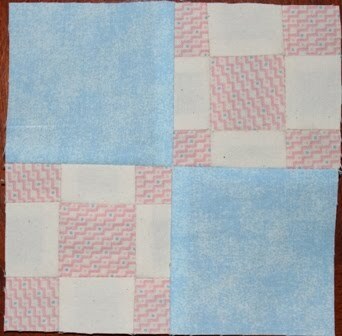 I decided to cut a bunch of rectangles 1.5 by 2 inches and use those instead. 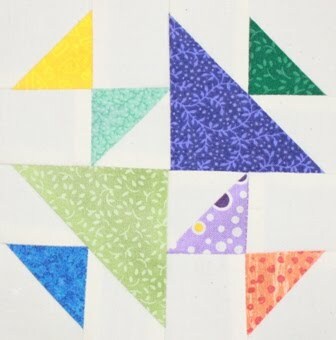 I'm sure the quilt police are having a hissy right now about the catty wompus grain lines, but look at the size of those little pieces -- it can't matter that much, can it? 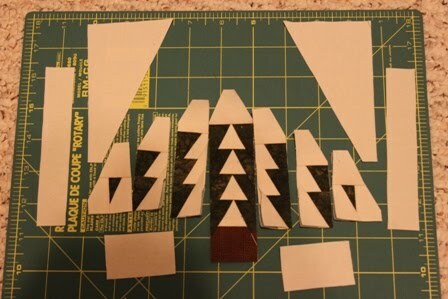 So after each of the subunits was done, I started sewing them together left to right, just like the directions said. Somehow that left me with inset seams along the bottom of the tree. I tried to make it work, really I did, but look at those funky angles! Instead I just pulled off those long skinny side pieces, straightened the whole thing up and sewed some strips on at the ends. It wasn't until I was taking the picture at the end that I noticed that the tip of the tree was supposed to be green. Whoops. I would have skipped this block for sure if I wasn't going in order. I'm glad it is done now though, and I can move on. 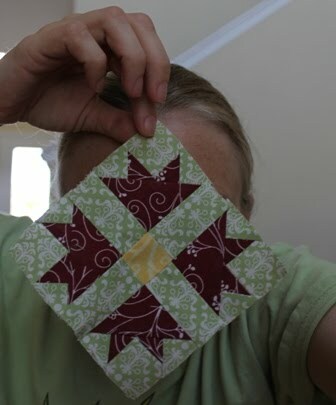 The next block looks super cute and much easier. Anna has been asking for a long time to go out to the Melting Pot as a special night out. 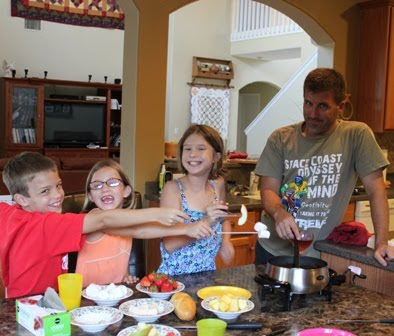 Kurt isn't so much in favor of spending that kind of money, so instead we got a fondue pot for home and had our own Melting Pot dinner at home. The kids all thought it was great fun and want to do it every week. They already have the menu planned out for the next few sessions and it all sounds delicious. I love starting school on a short week. It's only been 3 days and already we have a weekend to recover. I spent part of the morning making block 15 which was a string block. It was pretty straight forward and simple even though the strings were pretty skinny. 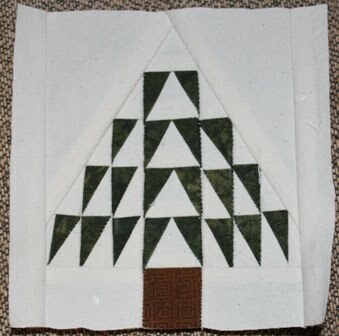 I have started on the next block, a Christmas tree, which is truly frightening. If I were not doing these strictly in order I would skip this one for a very long time. Anna has her ice skating recital this tomorrow and there was the usual practice this morning, but football hasn't started yet, and there is not a lot on the schedule for the weekend. It should be nice and relaxing I hope with some time to tidy up around the house and putter away on my blocks. I thought I was cutting the pieces bigger than they needed to be, which seems to help with paper piecing. I guess I needed to make them even bigger than that. My seam allowances were getting pretty skimpy, so I ended up cutting some new triangles midway through this block. 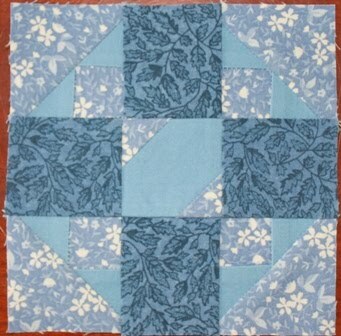 It was when I dug into the scrap basket to find more fabric that I realized the blue was the same that I used in block 13. They came from entirely different sources, and I didn't think about them being the same, but sure enough I had some in my stash and some in the leftover Dear Jane bits. 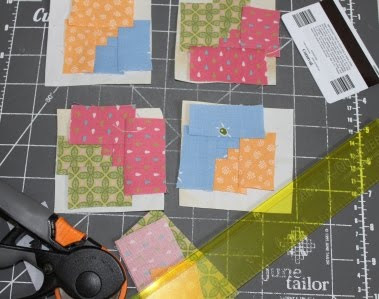 I'm trying to to repeat fabrics and it seemed easier to replace the two squares from block 13 than redo all the paper piecing in this block. I'm all out of the super nifty dissolvo paper, so I went out and got some tracing paper. It isn't nearly as nice, being slippery against the fabric and getting caught in the printer. I went online to find more of the paper and found some in magic shops of all places. It may be easier to go to the fabric store for some more of the fundation paper. I couldn't resist just one more block when I peeked and saw how easy this one looked. It was a simple, quick block. It is called Sheep Field. I have no idea where that name came from. Now I'm off to bed. Goodnight all. Block 12 is called Indiana Puzzle. 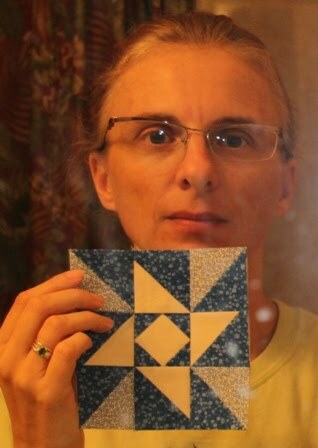 It was paper pieced, which helped with keeping the colors straight. It was a nice simple, straight forward block. I had to take a picture in the mirror because nobody is home again. I guess I can only sew blocks when everyone leaves at the same time. Kurt was subbing on an outdoor non-beach volleyball team tonight and took the kids with him. 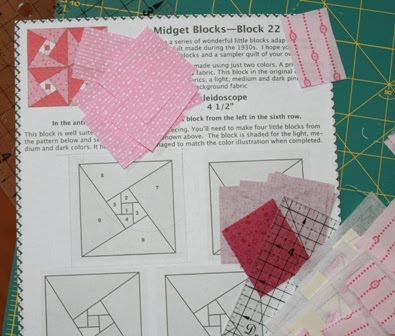 There was a fat quarter sale at Joann's a couple of weeks ago, and the kids helped me pick out small scale prints to use with the Midget Blocks. I think they did a great job. I don't have specific blocks in mind yet, because I'm working strictly in order, one block at a time. The fabric has all been prewashed and nicely ironed. Now I'm ready to use it and make some more blocks. Take advantage of free patterns. 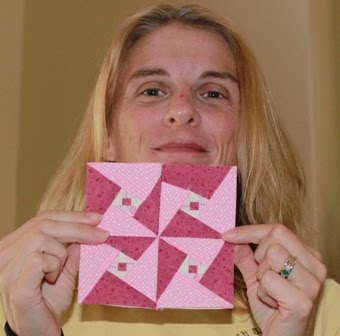 With all the free quilt, block and quilting patterns available on web sites and blogs, I amazed that any of us still buy magazines and books on a regular basis. The first site with lots of free patterns I remember finding was Quilters Cache by Marcia Hohn. It has LOTS of blocks and is easy to search by size or name. It can be a bit overwhelming due to the shear volume of patterns, but wow, what a resource. Several years ago I discovered Quiltville where Bonnie Hunter has great patterns and organizational tips for using scraps. 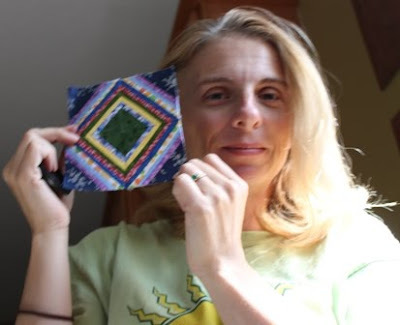 She also posts mystery quilts, the next of those is due in November I believe. 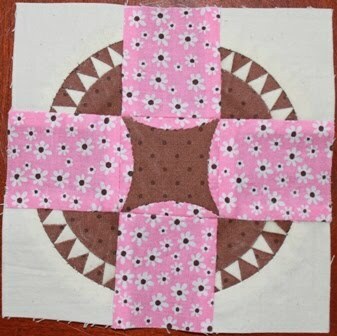 My most recent discovery was Sentimental Stitches where my new favorite Midget Blocks are posted. 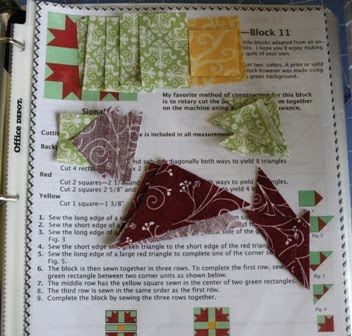 Don't forget about block of the months like Amy's Passions and Morning Glory Designs. Not to mention all quilt alongs periodically hosted by fabulous people like Crazy Mom Quilts and Judy at Patchwork Times. In fact, the problems isn't finding a great idea for a quilt, it is always that there are too many great ideas and too few hours in the day. So bookmark them, save them for later, but make sure you take advantage of all of the inspiration, free for the taking. Remember the old Doritos commercial, "Crunch all you want, we'll make more." I'm starting to feel like that about my little Midget Blocks. 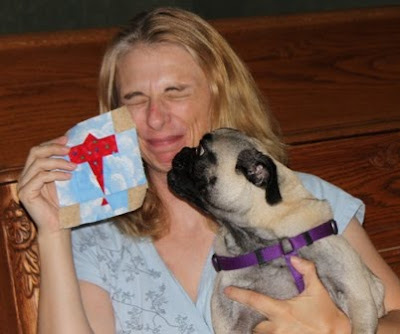 I was trying to explain my new addiction to a non quilty friend who reads my blog and she wanted to know if I was making little blocks because they were easier than big blocks. Is it all the tiny little pieces that fit together like a tiny little puzzle? Is it figuring out a new trick to make them turn out well, like finger pressing these tiny squares to find the center to line up the triangles? I'm not sure why I like them, but I do, so here is block 11, which is called Signal. 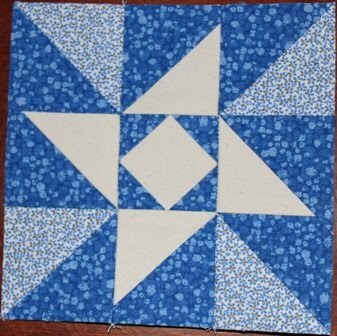 It is traditionally pieced and is missing the sharp perfection that I am beginning to enjoy in paper pieced blocks. I does measure out to 5 inches though, even though I had to get a little aggressive with the steam to make sure it would fit. 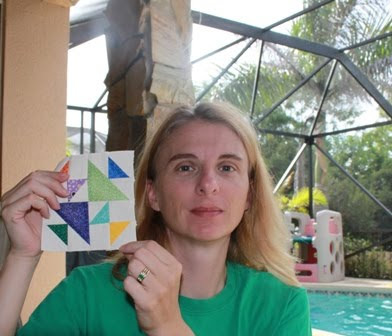 I found a German blogger yesterday who was working on the blocks and posted 50 of them, but she stopped in January of last year. It was fun though, to see her working on the same blocks. These little blocks are just about as addictive as bejeweled on facebook. I keep thinking I should stop, but then I start just one more. I've got some school work to do this evening, but this afternoon I worked on block 10 which is a Log Cabin. 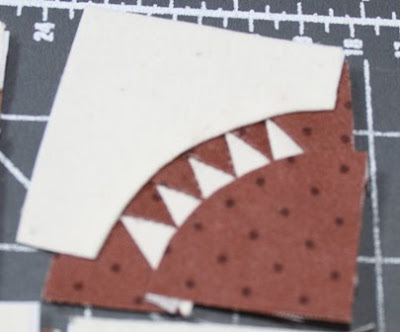 I must say that my paper piecing skills are improving as I work through these little guys. I've learned that trimming threads as you go along makes for a much neater finished product and that it is easier to waste a little fabric by cutting fabric too big than worry about exact sizes. I've been using an add a quarter ruler to trim the patches, but I might try an add an eighth to see if it makes for a lighter block. The numbering on the this one and the pineapple were different than what I would have done, so I had to be careful to make sure I was following along in the right order. I think they would turn out the same either way, but it helps to keep track with 4 subunits if you are on the same number at the same time on all of them. 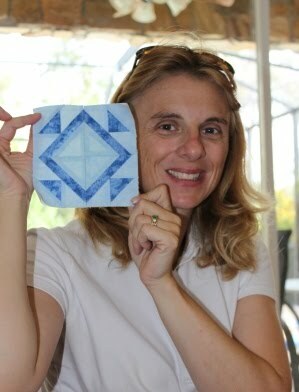 Here is the finished block, isn't it a cutie? I had a good first day of school. I'll sit down tonight and finalize plans for the first couple of chapters in each class and make sure I have everything I need. Today was full of exciting organization things like the syllabus and rules and books. I'm doing a part time schedule this year and it is a lovely feeling to leave in the middle of the day. I went to the grocery store and had a relaxing lunch. Pure bliss. Last night was the Girl Scout leader meeting and my friend Meisje got suckered into volunteered to plan the leader daughter camping trip this year. That means she is invited to the planning meetings, lucky girl. I was glad she came though, because we went out after for sushi and two-for-one mango martinis. I may look forward to these meetings if we keep going out after.